When working with Safari's inability to trust the Companyweb SSL certificate, it froze up. There were 4 tabs open, one to Companyweb, one to Google, one to an MS site, and one to an article by Eriq Neale that turned out to be not applicable. So, on a Windows box we would CTRL+ALT+Delete to bring up the menu needed to access the Task Manager or right click on the Taskbar and click on the link to the Task Manager. From there, we would end the errant process or application. 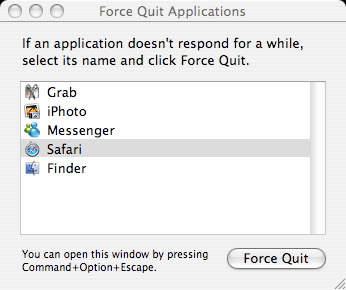 Under the Apple menu is "Force Quit". If the program is unresponsive, there should be a "(unresponsive)". Click on the errant application then the Force Quit button, and the program is done. 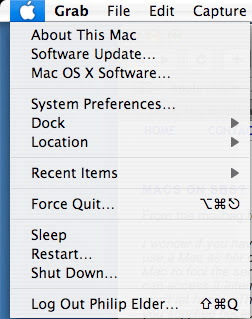 Anyone want to clue me in on what the keyboard shortcut symbols beside the above Force Quit menu mean? I see the Apple symbol/four round corner button, but not the other two. Thank you, so helpful. I hate the Numbers program for Mac!